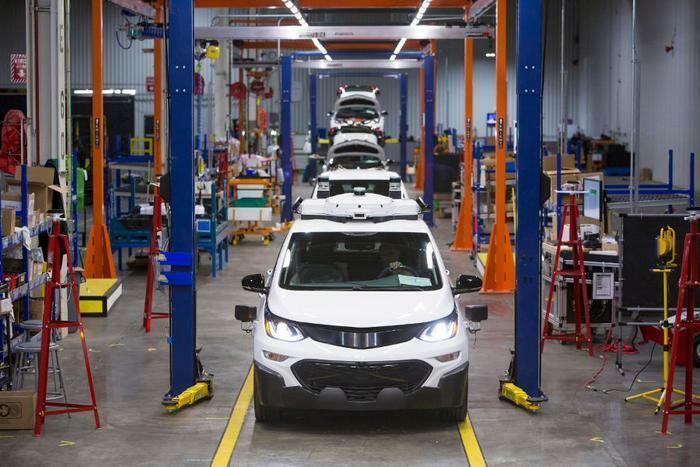 Self-driving Chevrolet Bolt EVs are rolling off the assembly line at General Motors' Orion Assembly Plant in Michigan. GM says that makes it the first company to assemble self-driving cars in a mass-production facility. The second-generation, all-electric hatchbacks will join more than 50 first-generation self-driving Bolts already on the streets of San Francisco, Scottsdale, Ariz., and metro Detroit. The self-driving Chevrolet Bolt EVs feature GM’s latest array of equipment, including LIDAR, cameras, sensors, and other hardware designed to make the compact cars safe, reliable, and fully autonomous. Building a handful of cars and driving them around in a few warm-weather locales doesn't do the trick, GM executives said, throwing shade on Google, Uber, and a handful of other companies that have small test fleets. GM is also building non-autonomous Bolts and the Chevrolet Spark at the Orion plant.